This is one tough elf! He’s made of two layers of DuraBite Fleece, lined with a rip-stop technology, and stuffed with foam. Henry approves of the squeaker! 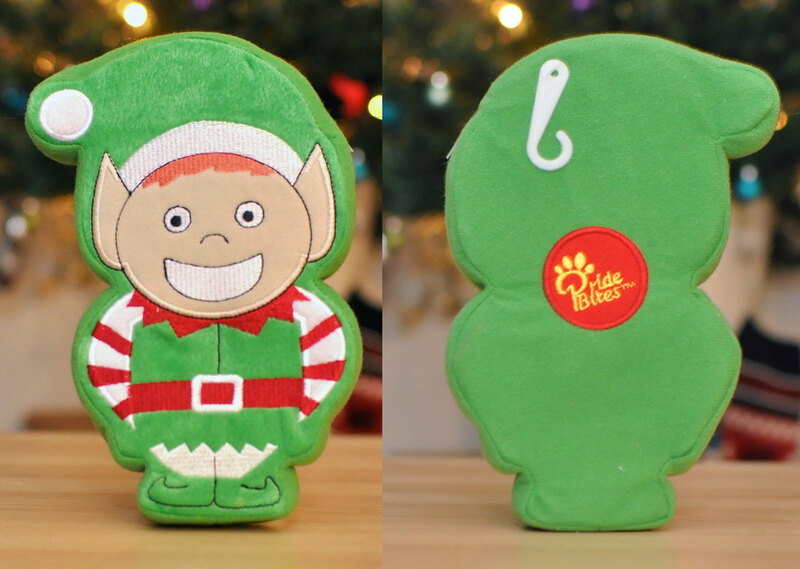 I love that PrideBites toys float, too – my parents just moved to a house on a lake so I have a feeling we’ll be playing with this elf year-round! Squeak? Check. Crinkle? Check. Holiday cheer? Double check! 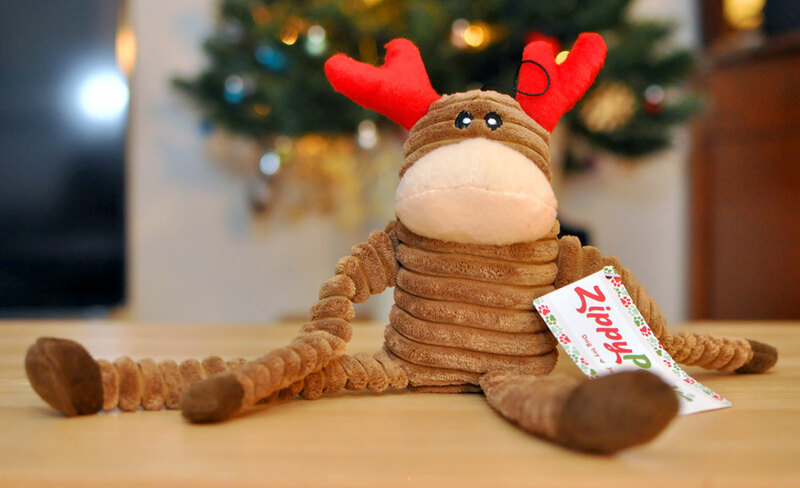 Henry can’t resist a toy that both squeaks and crinkles, so I think this reindeer toy will be a perennial Christmas favorite in our household. Plus, those long, thin limbs are great for shaking and flailing around! Camberville dog treats. Sweet potato and peanut butter. We love Camberville Dog Treats! We’ve received them in other subscription box services and Henry goes nuts over them. 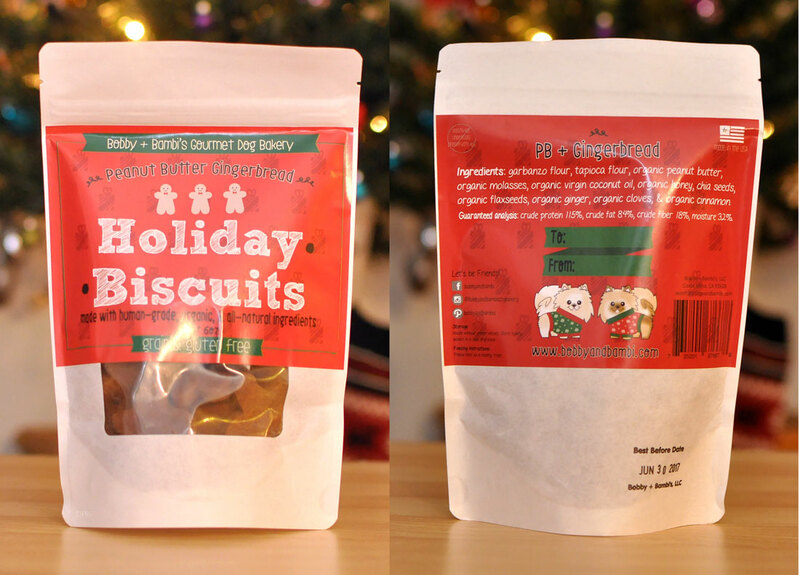 We love that Camberville Dog Treats bakes in small batches uses the best ingredients possible from local farms. Plus, look at that ingredient list: only three (delicious-sounding) items! Peanut butter and gingerbread flavored? Can I share, Henry? These treats are Handmade in a California commercial kitchen and are grain-, gluten-, wheat-, soy-, sugar-, salt- and egg-free. In addition, they’re organic, human-grade, and preservative-free. 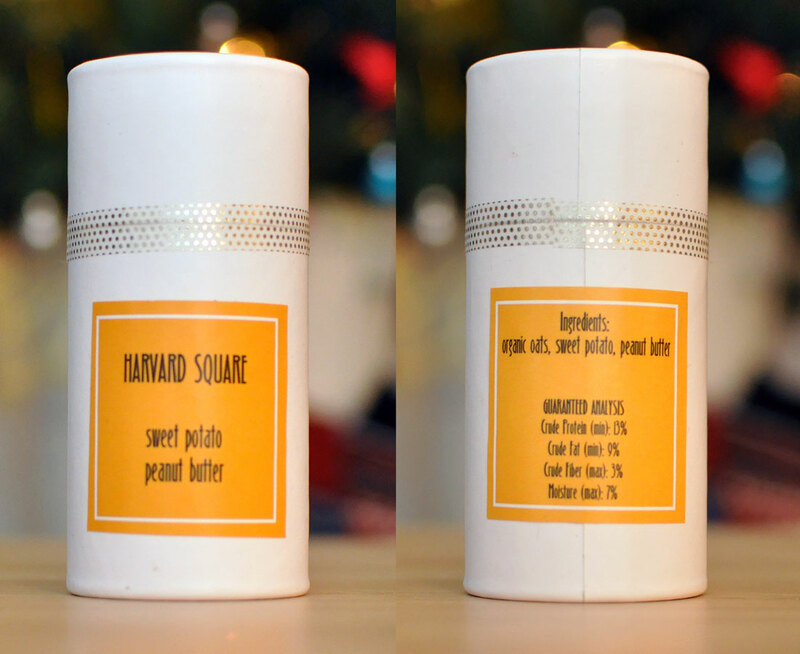 Plus, the packaging pouch is both compostable and biodegradable, with a label printed with soy and vegetable based dye on recycled paper. Wow! That’s a long list of perks. I think it’s so awesome that Bobby and Bambi are so dedicated to keeping pups healthy, being nice to the environment, AND creating delicious treats. 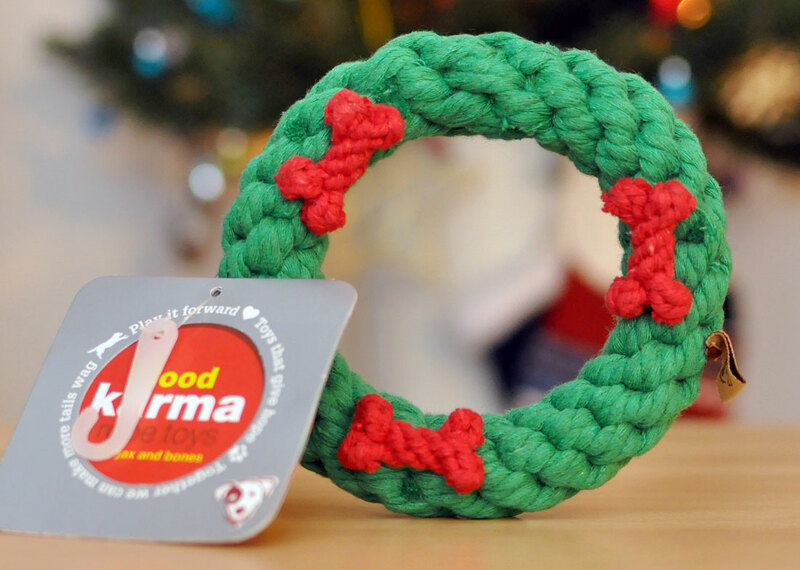 Now that’s a holiday cookie your pup can feel good about! Henry LOVES this toy! We first broke it out during a little Instagram Live event we did, and I was thrilled that he spent so long playing with it while I answered questions from our followers who tuned in. He loves chasing it and chewing it, and it’s an adorably festive toy. Guess Henry isn’t on the Naughty List! 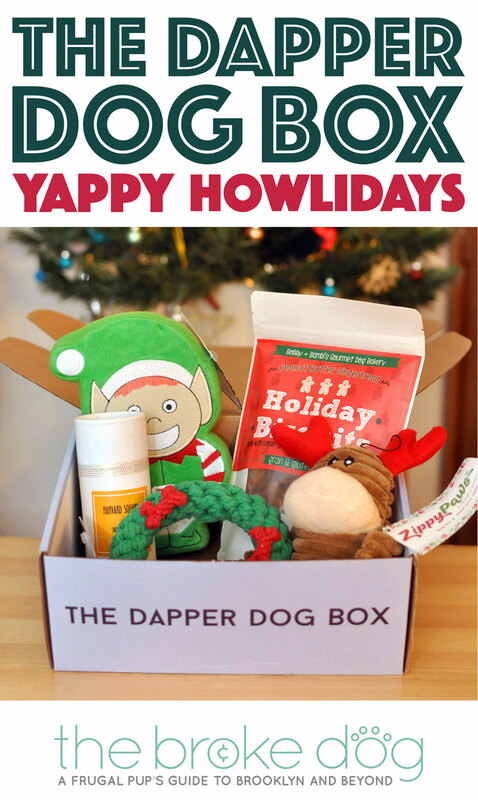 What a great box stuffed with lots of goodies! 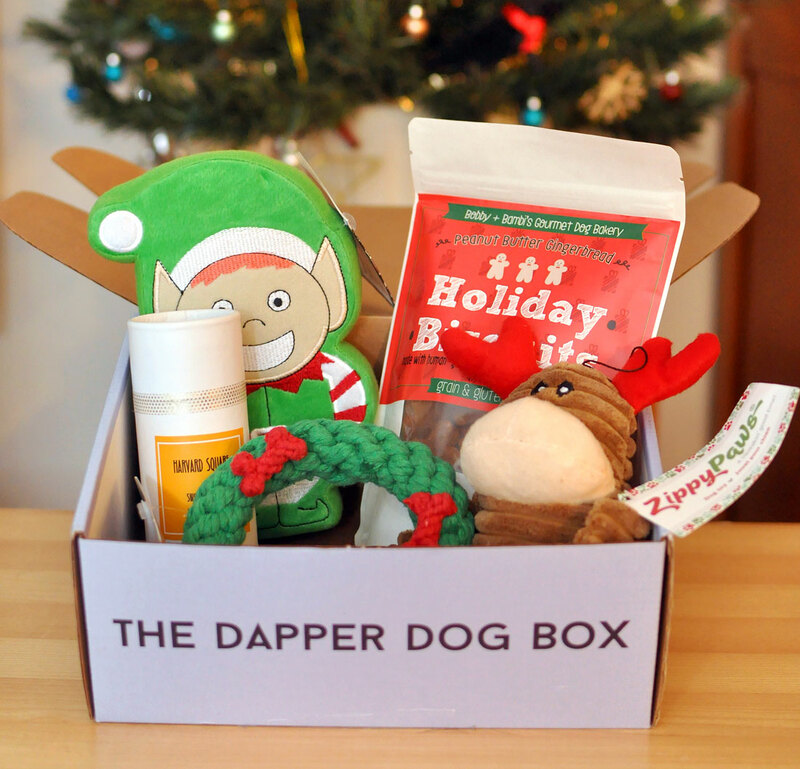 Thank you to Dapper Dog Box for supporting small and artisan companies, and for including such delightfully festive toys to help Henry get in the holiday spirit! I think that Jax and Bones wreath is going to be a perennial favorite if it survives into the New Year! Remember to buy your own using code HENRY and save 15%. Henry and I sincerely wish each and every one of you a happy, healthy holiday season and hope that your New Year is filled with fun and puppy love. Thanks so much for joining us this year and we can’t wait to bring you more exciting content in 2017! Thank you Rochelle and Henry for the lovely words!